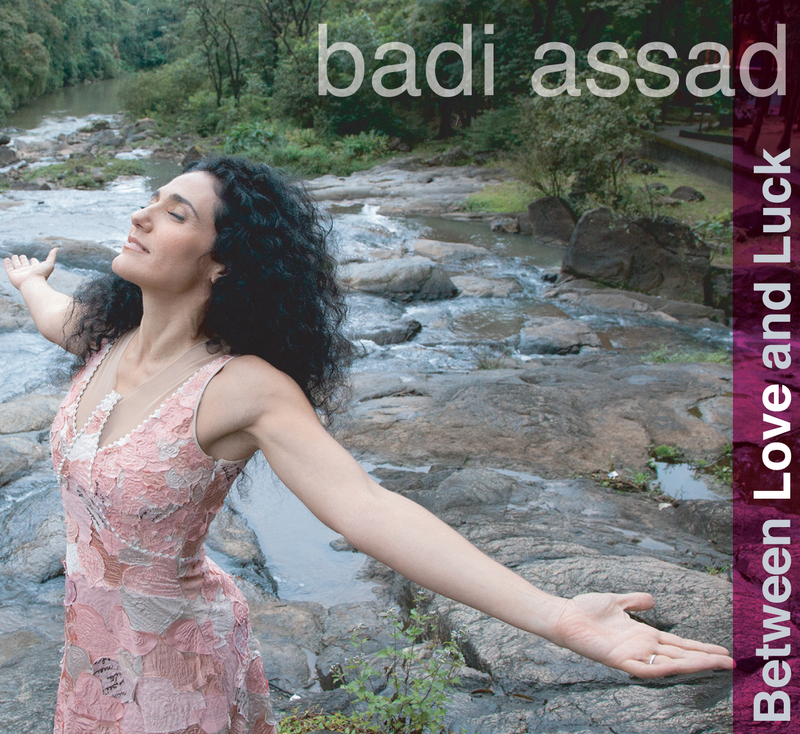 São Paulo, Brazil – Badi Assad is one of the most innovative, passionate and talented artists of her generation and listed by Rolling Stone as a top guitarist from Brazil. She transcends traditional styles of her native Brazilian music with a mixture of pop, jazz and ethnic sounds from around the world. As a result, the singer, guitarist and songwriter is successfully forging an exhilarating genre of music that quite literally defies categorization. ‘Between Love and Luck’ is her first CD of all original material and sung in both English and Portuguese. It also debuts QuatroVentos her new independent label and first U.S. Release in 6 years. The repertoire of acoustic and electronic compositions features strong melodies and deeply personal lyrics of everyday and existential experiences of life, art and love. The themes deal with the past journeys and adventures – the latest ones such as motherhood, new love and new experiences in learning how to love and seek ones own balance. It also speaks of addictive behaviors like working too hard and dependent relationships. Some of the themes blend together in life. And because love is also chronic, in the literal sense of the word: it is long term, and happens repeatedly and often. Badi sings, plays guitar on all tracks. Percussionist Guilherme Kastrup and multi-instrumentalist Marcio Arantes produced the album. Badi was born in São Paulo, Brazil. The sister of Sérgio and Odair Assad, of the world renowned classical guitar duo The Assad Brothers, she began to play guitar when she was 14. Badi won international recognition by combining her talents as a singer, guitar player and vocal percussionist (simultaneously producing different vocal sounds), her recognized technical abilities and unquenchable thirst for innovation in her guitar playing has made her one of the most innovative artists of all time, maintaining a growing group of loyal fans, critics and fellow musicians worldwide. On stage, Badi Assad reveals a complete and virtuoso artist. An enchanting diva, she sings, plays guitar, dances and transforms her own body in percussion – all at the same time! With ten CDs released around the world and many awards won, her last CD, ‘Wonderland’, was ranked one of the 100 best albums of the year by the BBC. Badi was also voted one of the best guitarists in the world by Guitar Player Magazine. She has worked with artists such as Bobby McFerrin, Yo-Yo Ma, Sarah McLachlan, Seu Jorge and Naná Vasconcelos among many others and performed in some of the most prestigious international festivals such as Montreal Jazz Festival, North Sea Jazz Festival/ Holland and theater such as L’Opera de Paris, Metropolitan Museum / New York, Palais de Beaux- Art /Bruxellas, and The Greek Theater / Los Angeles as well as appearing in the acclaimed FarmAid and Lilith Fair tours. In 2012 Badi also represented Brazil at the IV BRICS Summit, an event that brings together the major emerging economies of the world. She also performed with the Ballet Teatro Castro Alves at the prestigious Bienalle of Venice. APCA (São Paulo Association of Art Clinics) – one of the most important awards in Brazil since 1972, recently awarded Badi for her work in songwriting and composition. The same evening the Brazilian icon Marisa Monte also graced the same stage. Badi Assad will be touring across the USA in support of ‘Between Love and Luck’ in the summer of 2013. Select dates for this mid-summer tour include: July 13th & 14th at California World Fest in Grass Valley, CA, Various Bay Area shows including San Francisco and Santa Cruz, July 20th at Austin Chamber Music Society in Austin, TX and July 21st at City Winery in Chicago, IL. More tour dates including New York and Boston will be announced soon so please visit Badi’s website of Facebook page for more information. This entry was posted on Thursday, April 4th, 2013 at 18:58	and posted in Badi Assad, Press Release. You can follow any responses to this entry through the RSS 2.0 feed.